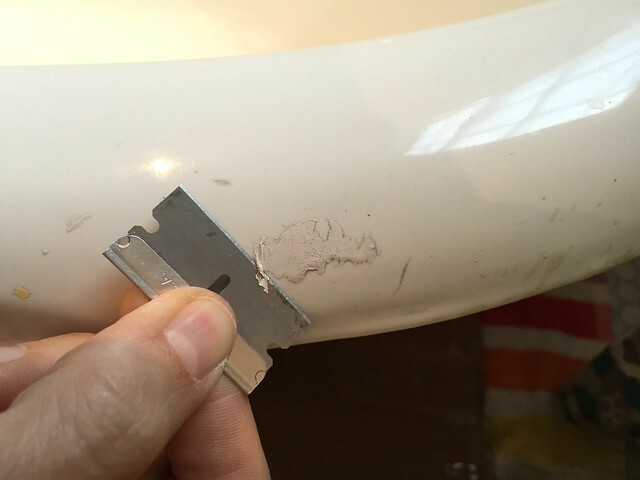 There's little "good information" out there regarding the rehabilitation of a salvaged clawfoot or other cast iron porcelain enamel tub. Whether it's a tip that is immediately contradicted by another, or simply a complete lack of real photos or high detail before and afters, finding information on how to proceed with this step of our restoration has been hard to come by. For this reason I've decided to go a bit more in depth about our efforts to first clean, and then restore the interior of our salvaged tub without going the nuclear route. What's the nuclear route? A complete re-coat spraying of the tub that's more traditionally offered by tub "refinishing" outfits. There are obviously many more options out there, but these are the most typical approaches I saw time and time again while researching our options. It seemed that whether I was watching This Old House, looking at examples online, or even taking to people at salvage yards, having the tub sprayed was the only option. There is an outfit in Michigan that you can ship your tub off to and they'll actually re-porcelain the whole thing and fire it in an oven, but that costs thousands of dollars and is really only considered if the item has historical significance. Early on I'd nearly accepted defeat and assumed we'd just have the tub shipped out and sprayed offsite, then returned for install. That is until we started to see examples of sprayed tubs immediately after the work was completed, or examples many years after the work was done and after the coating began to fail. What we saw started as flawless, perfect tubs and ended up looking yellow, bubbled, and peeling, sometimes in under 10 years! Our tub just turned 90 years old and is still in pretty good shape, but it never looked flawless and perfect, not even on day one. The porcelain enamel process of firing 90 years ago left imperfections throughout the tub by way of bumps and spots. They're not significant or unsightly, but rather give a level of character to the tub that sets it apart as an antique. More importantly, we want a tub that will still look great in 10, 20, 30, 50 or more years, without having to go the nuclear route and spray it all over again. 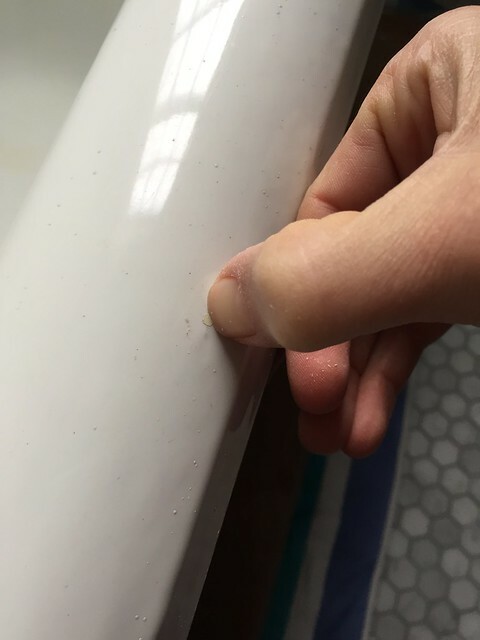 The whole purpose of choosing a cast iron tub is for its long lasting durability, and a failing surface doesn't say durability to me. 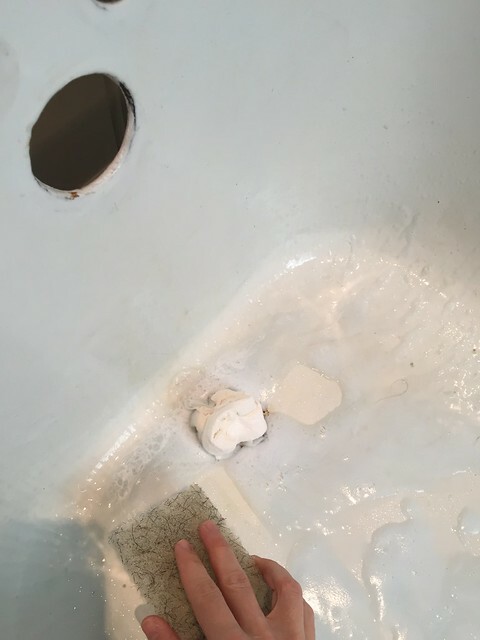 The first step to achieving our goal was to clean the tub's porcelain. I'm not talking about a quick wipe down with Windex and a paper towel, I'm talking a complete and thorough cleaning many times over. I started by focusing on the little flecks and drops of paint that were somehow splattered all over the tub's surface. I don't know how they got there, but it looked like the Dutch Boy sneezed all over the tub at some point in its history. Many of these splatters of paint could be removed with my thumbnail and a little pressure. Anything I couldn't get with my thumbnail I could typically remove with a little light pressure on a razor blade. It wasn't fast by any means, and it probably took me about three to four hours of gradual effort total to clean the whole thing, but in relatively short order all of the paint was finally removed from the tub. 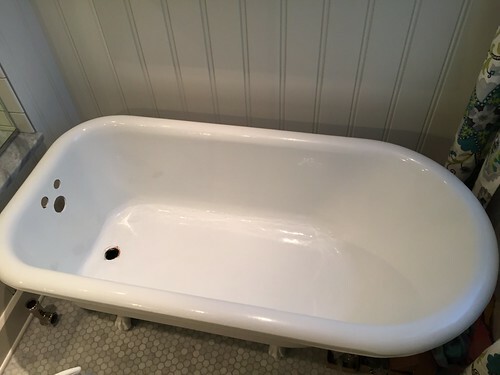 Though all of the paint was removed, and the tub was looking pretty good, there were still a bunch of areas where the tub had yellowed, had scratches or pits, or had stubborn stains that I couldn't remove no matter how hard or which product I had tried. I attempted the BonAmi route as recommended by a couple of the clawfoot tub websites, as well as a few other standard products. They worked to some extent, but scrub as I may, I just couldn't get the tub totally clean. I began to assume that a completely clean tub was not in my destiny if I wanted to maintain the original look of the tub, and I was somewhat begrudgingly okay with that. 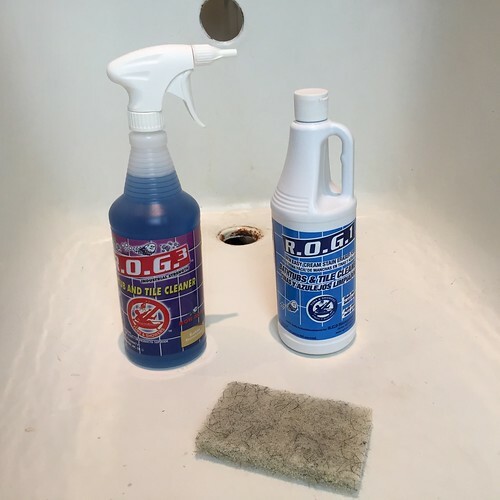 Then while looking around online, I found a website recommending a very specialized commercial tub and tile cleaner product called R.O.G 1 and R.O.G. 3. It promised miracle results, but I could find very little additional information on this supposedly magical product. Beyond the manufacturer's website and a single oddly written blog post saying how great it was, there was nothing to be found. It felt like I was watching an Internet infomercial. 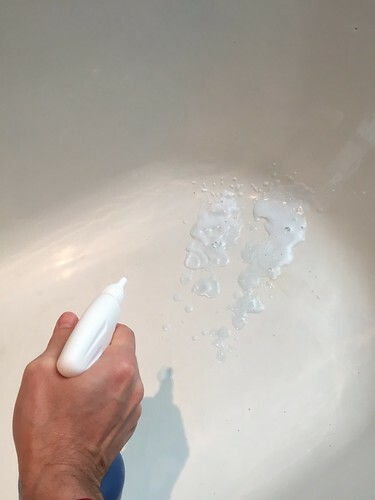 Apparently major hotel chains use this cleaner, and Kohler specifically recommends it as the cleaner for their tub's non-slip surfaces. Somewhat skeptical, I placed an order for the cleaner in spite of the rather exorbitant shipping charges. I don't know why, but it felt like I was falling victim to an Internet scam targeting the masses of unsuspecting clawfoot tub restorers...there has to be billions of us. The cleaner arrived and I was nervously eager to give it a shot. I started by spraying down the whole tub with the blue stuff called ROG3, using its supplied foaming spray nozzle. 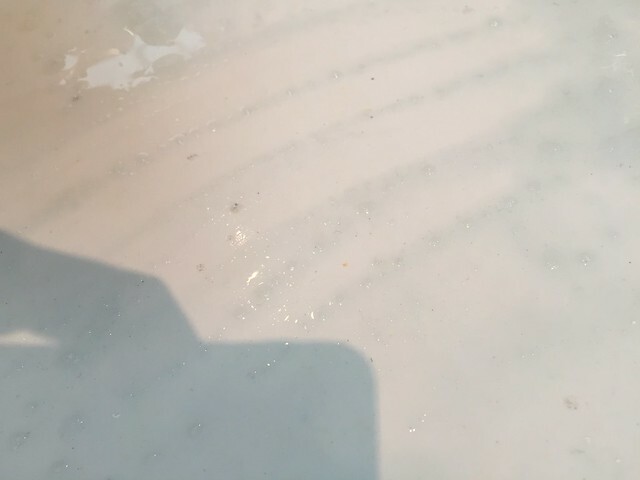 I spread the cleaner over the whole tub then allowed it to sit for five minutes to "work" into the surface and cut through any buildup. 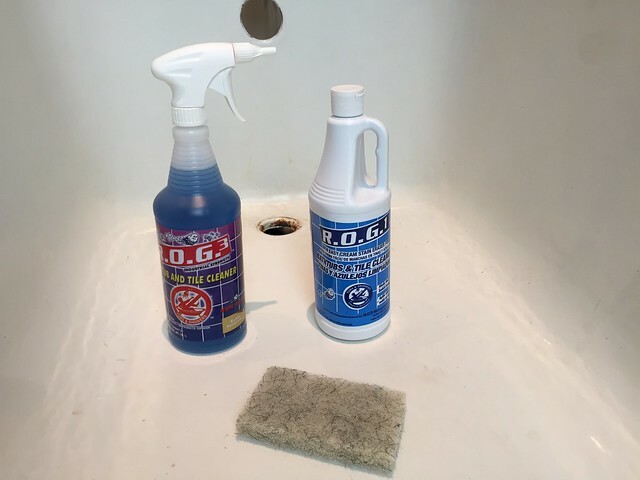 The idea here was to first give the tub a deep clean using the ROG3 and scrubbing with the supplied nylon scrub pad. One of the big advantages of this cleaner is the fact that it's non acidic, unlike vinegar, so it doesn't further break down or etch the already damaged enamel. This is why it can be allowed to sit on the surface rather than needing to be wiped immediately. I slowly worked my way around the whole tub, really scrubbing away at the particularly dirty areas. 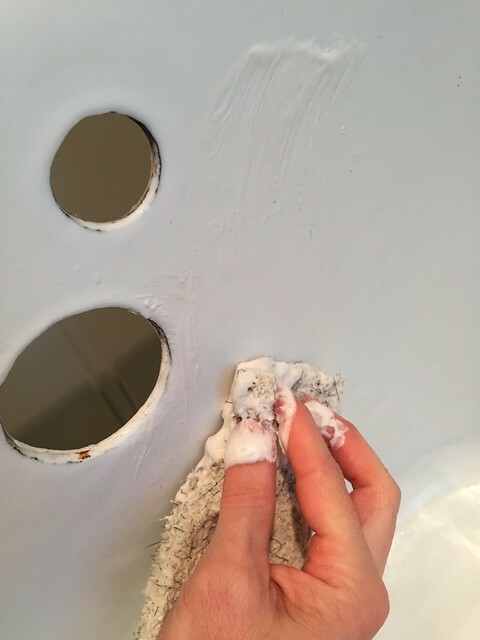 It was tough to see while we the cleaner was still on the tub, but it seemed like a lot of the really stubborn dark spots on the bottom of the tub were starting to fade. Once the whole tub had been scrubbed with the ROG3 I wiped it all down with wet rags to completely remove the cleaner from the surface. It was already looking better and the cleaner had me rethinking my role as Internet sucker. Next up I decided to go for it and apply the ROG1. This stuff seems like more of a polishing/scrubbing product than the other cleaner. Again, it's non-acidic and is actually quite alkaline. Though the instructions point out that gloves are optional, I'd definitely recommend wearing them. I didn't and my hands felt like they do after working in grout or cement all day. Anyhow, I shook the bottle and then flipped the top to apply it generously all over the bottom of the tub. 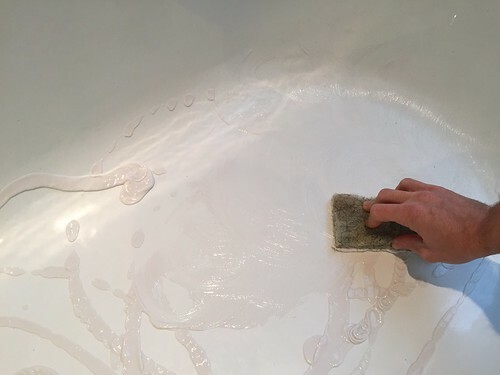 Using the same scrub pad I had used with the cleaner, I began spreading the scrubbing cleaner all over the bottom and sides of the tub, then I allowed it to sit and work. It felt a bit like a paste wax tends to feel and required moderate to significant effort to get things really clean. The best example of where this was able to resolve our issues was on the dark marks all over the tub. 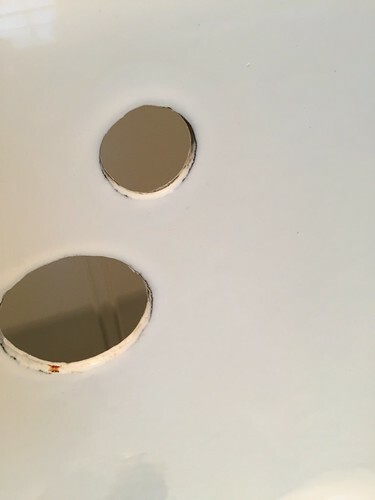 They were on the tub rim and near the drain holes at the front. They're somewhat difficult to see, but once you see them they're really all you notice. The following photo, you can faintly see the grey and black marks, probably from a handheld bath nozzle. ...but once I really started to work the ROG1 into the marks, they all quickly faded away. One of the nice things about the ROG1 is that it smells a bit like Wint-O-Green Lifesavers, rather than abrasive cleaner, so that was sort of nice. Once the whole tub had been throughly scrubbed, I rinsed the whole thing using water and rags to remove the cleaner residue, then wiped it all down with more water and rags to be sure I had gotten it all off. The results were nothing less than amazing. The tub was cleaner than I ever thought we could get it ourselves. 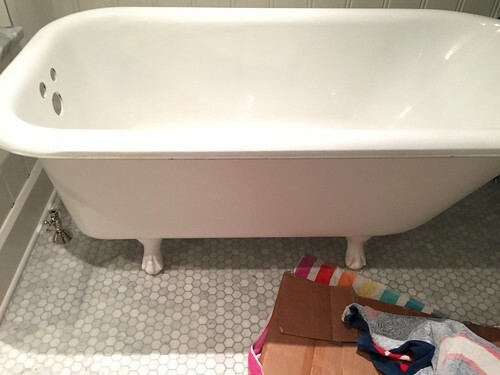 The dark marks, scuffs, and patchy dark spots on the tub's bottom were all gone. All of the original character and imperfections were intact, but all of the grime and later additions had been removed. Most importantly, anywhere that were scratches that had collected dirty had been thoroughly cleaned. This is where we stand today. Our tub is as clean as we've ever seen it. If we wanted to, we could hook it up and begin using it today. However, the gloss enamel in the tub's bottom is still completely worn away from 80 years of use prior to our ownership. This has left a matte finish of white porcelain, susceptible to more breakdown under additional use. We have a few ideas of how to resolve this missing enamel issue as well as the minor surface scratches around the rim. I'm going to give it a go and report back once we're done. But until then, if you're looking for a good tile and tub cleaner, or if you've seen the ROG products and were completely skeptical, I'd say you can go ahead with your order with at least a little more confidence. 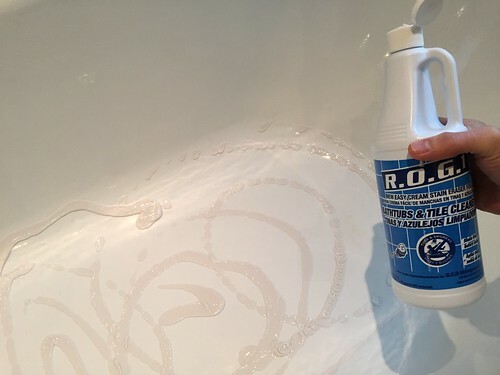 Next up we're going to be trying this cleaner out on a few other areas, like the dirty looking grout in our guest bathroom and some stuff in the new house too. We'll be sure to report back on that as well. Is the gloss coating that you are referring to in any way related to the gel coating I hear/read fiberglass guys talking about (e.g. on a boat or car)? Thanks for the tip on the cleaning product! There are a lot of reviews for this product on Amazon, with plenty agreeing with your assessment that this performs miracles on old porcelain. Most interestingly, I like the tip to attach the scrub pad to an electric sander, and cut your scrubbing down to minutes. That makes a "way more elbow grease than I have in me" product sound much more appealing! Thanks for the excellent rec, I will try this out on my old porcelain tub! 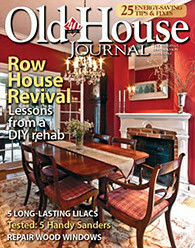 Did you see the post on Retro Renovation? Pam had similar amazing results with ROG. Thanks for sharing this link, Rebecca! We hadn't seen the post over on Retro Renovation, but that's great news that Pam had similar results. Her tub looks awesome! Thank you! You should do an infomercial. :D We have two original claw foot tubs in BHH. One has rarely been used, and it is perfect. The one in our main bathroom is used a lot since we do not have a shower or any other way to bathe here. 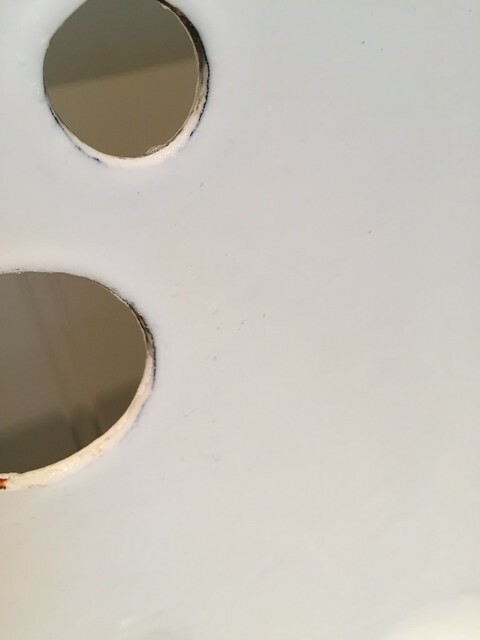 The paint is chipping on the underside, and there is rust around the upper drain. I have been thinking (and thinking and thinking) about how to go about the project. Guess I will clean it first, and then think some more. Scouring the Internet is good practice for scoring the tub, right?? ?? Have you tried any of your ideas on the enamel? We have a similar bath that we had resurfaced 10 years ago,we didn't use it for 7 years as it wasn't plumbed,3 years after we started. Using it the surface started to peel in places.It looks grey underneath,could be concrete ,any tips on restoring this,and any tips of getting out of the bath would be appreciated,I'm getting on a bit and a little unsteady on my feet. 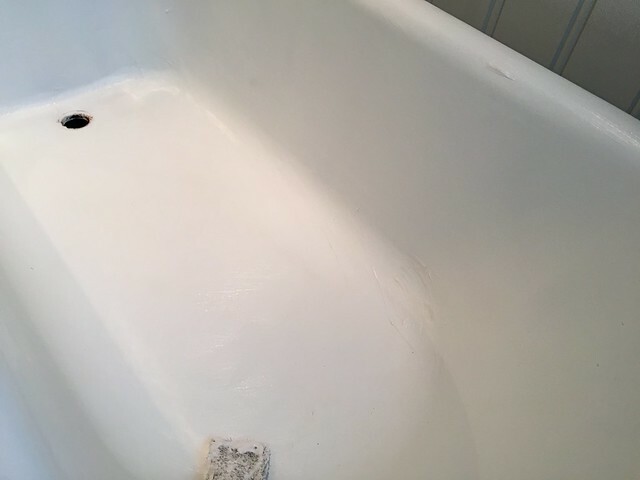 Can you tell me how much of the cleaner you used on the tub? Did it take the entire container to get it perfectly clean? How did you resolve the missing enamel issue? I need to do something to my claw foot tub. Hi there! Been reading up on your efforts to restore your beautiful tub. Did you ever figure out how to get the enamel glowing again?